Attack #1:  Exeggutor's Paradise For each of your Benched Exeggcute, search your deck for an Alolan Exeggutor or Alolan Exeggutor GX and put it onto that Exeggcute to evolve it. Then, shuffle your deck. 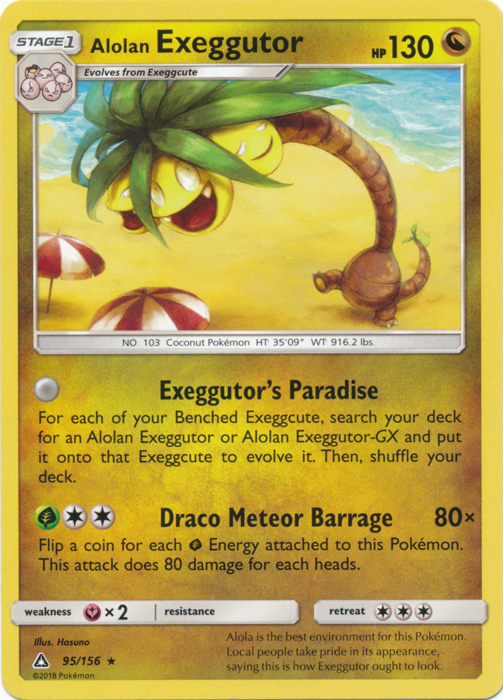 Attack #2: [2G] Draco Meteor Barrage (80x) Flip a coin for each Grass Energy attached to this Pokemon. This attack does 80 damage for each heads.